Lovingly maintained condo rentals and lush grounds make Cypress Bend a renowned resort in North Myrtle Beach, South Carolina. This remarkable North Myrtle Beach resort has amenities in spades and is an exceptional choice for your long-awaited South Carolina vacation. When you are looking for the ideal North Myrtle Beach condo, look no further than this well-known resort for a fantastic value. This inviting resort has beautifully kept grounds with pleasant sitting areas. The lovely grounds at Cypress Bend have peaceful lakes and ponds with water features. There are plenty of areas to walk and explore when you vacation at this delightful resort in North Myrtle Beach, South Carolina. Avid golfers will be instantly charmed by this relaxing vacation destination. There are more than 100 golf courses in the area surrounding your condo rental at Cypress Bend, including four golf courses in the immediate area. You and your family will not have to travel far from your North Myrtle Beach condo rental to visit one of the outstanding golf courses in the area. Many of the golf courses near Cypress Bend feature helpful pros that can perfect your putt as well as driving ranges and other amenities. Cypress Bend has an abundance of amenities and gives families the most bang for their buck. 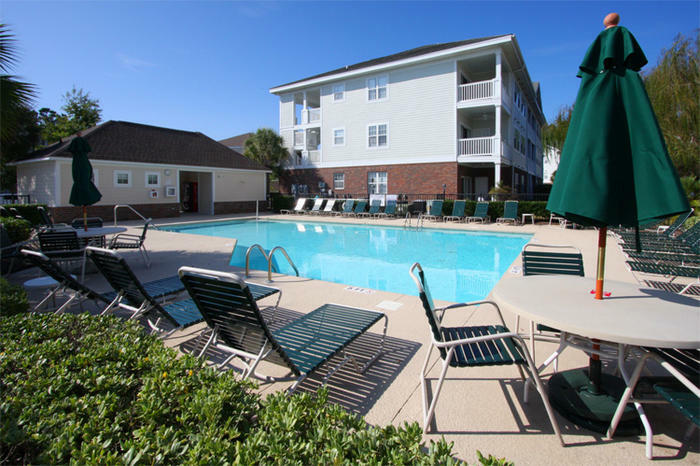 Start your day with a relaxing swim in the outdoor swimming pool near your welcoming condo rental in North Myrtle Beach, South Carolina. You can play games with your family in the outdoor swimming pool and stay cool when the sun is high overhead outside of your attractive North Myrtle Beach condo rental. Chaise lounges and chairs surround the refreshing outdoor swimming pool at Cypress Bend. You and your family can relax on the spacious pool deck outside of your welcoming condo rental and work on a tan that will make all of your neighbors back home envious. After you spend a day or two experiencing some of what North Myrtle Beach has to offer, treat yourself to the rejuvenating waters of the outdoor hot tub. Let the massaging waters of the outdoor hot tub outside of your appealing North Myrtle Beach condo relax your body and help you unwind after a day full of fun. After you loosen up tight and tired muscles in the warm and relaxing waters of the outdoor hot tub, you can retire to your tranquil North Myrtle Beach condo rental and get the restful sleep you need to make the most of your well-deserved vacation. The condo rentals at Cypress Bend are unique and offer guests a wonderful way to experience North Myrtle Beach, South Carolina. In a two-bedroom condo rental at this North Myrtle Beach resort you will have space for seven guests. Tell your family to pack their bags and surprise them with an unexpected trip to the gorgeous North Myrtle Beach area. With spacious accommodations and a desirable location, this stylish North Myrtle Beach condo rental will be a hit with the entire family. You will have all of the room you need and the privacy you desire while you vacation at Cypress Bend in North Myrtle Beach, South Carolina. When you stay in an unforgettable condo rental at this exclusive North Myrtle Beach resort, you will be able to cook fabulous meals for your family to enjoy. The kitchen in your upscale North Myrtle Beach condo rental will have all of the comforts of home giving you the freedom to prepare fresh and tasty meals for your family to enjoy while you are on vacation. You can rest assured that when you vacation at Cypress Bend, you will have a kitchen with plenty of space for groceries, full-size appliances and lots of counter space. The bedrooms in your comfortable North Myrtle Beach condo rental will be fully furnished and have beds with plush linens. Tastefully decorated, each bedroom of your appealing North Myrtle Beach condo rental will provide you with luxurious place to sleep. Sweet dreams and restful sleep are essential when you are on vacation and you will find both in your enchanting condo rental in North Myrtle Beach, South Carolina. You will appreciate other comforts in the bedrooms of your North Myrtle Beach condo rental such as television sets and ceiling fans. You and your family can gather around the dining room table of your impeccable North Myrtle Beach condo rental and reconnect over a delicious meal and a night of board games. Be sure to set aside some time to relax in your vibrant condo rental in North Myrtle Beach, South Carolina. You can join your loved ones on the porch at your budget-smart North Myrtle Beach condo rental and get the latest scoop on what has been happening in their lives. Spend some much-needed time enjoying the company of your loved ones at a stylish and practical condo rental at Cypress Bend in North Myrtle Beach, South Carolina. Elliott Beach Rentals is not affiliated with onsite management or the HOA of Cypress Bend.